As has become customary America has no compunction about lying. Russia was sanctioned on trumped up charges of invading East Ukraine, annexation of Crimea, meddling in the 2016 American presidential elections and, the most recent charge of “highly likely” having poisoned a former, inconsequential Russian double agent, who is an MI6 asset. But, thus far the Russian economy has not succumbed. Instead, on 1 March 2018 President Putin announced what was to upset US military superiority irretrievably, at least for several decades to come: Russia has developed weapons against which there is no defence. Despite his Helsinki meeting with Putin, Trump has imposed even harsher sanctions on Moscow based on unproven allegations made by London reminiscent of the false narrative leading to the Iraqi invasion. A combination of factors have, therefore, come together to drive the trade wars: the American mid-term elections; military defeat in Syria; and, de-dollarisation. And, Trump has adopted Bush’s uncompromising position of either the world is with the US, or against the US. As it stands the world is looking a lot like it is “against” the US except for such fading powers as Britain and Japan, and Australia, never a power centre. Nevertheless, this does not completely explain Trump’s global rampage. But if the Greater Israel project is a part of a Zionist US imperial plan — in less emotive terms the neo-conservative global New World Order — then a plausible answer is possible. 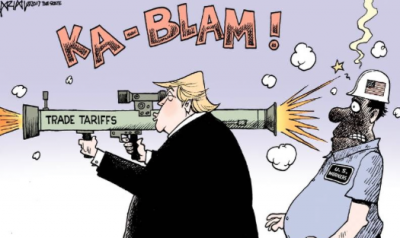 The trade war is Washigton’s strategy of choice as a first phase to bring the world to its knees. Askiah Adam is Executive Director of JUST Malaysia.